Along with I DON'T WANNA BE LEARNED/I DON'T WANNA BE TAMED, this track was one of two songs attempted at the first RAMONES demo session in 1975 that remained unreleased until the ALL THE STUFF (AND MORE) Vol. 1 CD compilation came out in 1990. The compositions reveal a fascinating insight into what the band considered unworthy of pursuing for full fledged recording later. Though obviously less developed than some of the material which ended up making the cut, both primitive compositions pack some power, and both are well served by the crunchy sound achieved by TOMMY at their first studio visit (see RAMONES: THE EARLY DEMOS). There's a big surprise waiting for the middle section, however. Although as a whole unceremoniously abandoned for future usage, the instrumental break would eventually be retooled as the primary riff of CHINESE ROCK-- hopefully settling once and for all DEEDEE's sole authorship of that multi-band classic. This sort of cannibalizing existent melodies for recycling into new material would become more prevalent as the RAMONES entered the latter part of their career. Here the riff makes a one string jump up from the key of A to D (a move which will be mimicked on the later track), but then makes another extra step an equal interval up to G. The exciting result is that the jump up to the unrelated realm of E for the last chorus has nearly the impact of a key change. In the style of the debut LP's HAVANA AFFAIR, this section is notably augmented by an extra overdubbed rhythm guitar for heavier punch (see HAVANA AFFAIR--Ramones 9). This is an interesting adornment for a mere demo session, perhaps reflecting that at least initially the band considered the song deserving of some attention. That the digital age has transformed this forgotten obscurity into a relatively common CD bonus track has been a turn of events most welcome. Culled from the earlier, album length batch of pre-SIRE demos, this raw recording features the only song attempted which was held back for inclusion until their third LP, ROCKET TO RUSSIA. Two other tracks (I CAN'T BE, I DON'T WANNA BE LEARNED/I DON'T WANNA BE TAMED) remained untried on any of the group's albums, and they also appear as extra tracks on the CD version of the debut. One of the first--if not the very first-- songwriting attempts by a pre-RAMONES JOEY, the tune was a mutation of the chords to 'I'm Eighteen' by ALICE COOPER. MICKEY LEIGH, after altering his guitar to be better utilized by the novice JOEY, apparently taught the rudiments of one of his brother's favorite song's melodies to him. He was soon surprised to find that he had constructed a new composition out of a primitive revamping of the hit's chorus. The nihilistic lyric was potently crystallized with what would soon be characteristic simplicity and directness. As with most of the rest of what is available from their inaugural studio efforts (see RAMONES; THE EARLY DEMOS), the song has been brought a step down slower, from its eventual official key of A down to G. ('I'm Eighteen,' interestingly enough, is pitched some distance away in E.) The stretched tempo does much to make the guitars and drums sound heavier and thicker. Also in common with this group of demos is how much more relaxed JOEY's singing seems when contrasted with the later LP takes, and the probable varispeeding has shaded his vocal with an unfamiliar depth of tone. Eventually the final version of this track will become one of their strongest album's most identifiable classics (even at this early stage of their sound's development they somehow verge near self parody)-- but the tough, chunky, loopiness of this initial blueprint will remain unmatched. The first two bonus tracks on the RAMONES cd are demos made in September 1975 after MARTY THAU had been secured as their manager. Earlier in the year the group had recorded an album's worth of songs with TOMMY at the helm (including another earlier version of this track.) These blistering, raw attempts (see RAMONES: THE EARLY DEMOS) succeeded in securing a single offer from SIRE for YOU'RE GONNA KILL THAT GIRL, but the band wanted to hold out for an album contract. Towards this end they re-recorded two of what were apparently felt to be their most commercial compositions, this and JUDY IS A PUNK. They shopped this new, more polished demo around to other labels with little success, and were no doubt relieved when SIRE finally came back with an offer to do a entire LP. Perhaps due to varispeeding, almost none of the early demos are in the eventual keys which they were officially recorded. All of the altered are in a lower key, and in some cases there is little doubt they have been slowed down. Whether this was done to accommodate easier vocal overdubs, or to simply minimize what were once considered the RAMONES' relentless tempos is unclear. I WANNA BE YOUR BOYFRIEND, however, is the track which reflects the greatest amount of tampering. No doubt wanting to accentuate the pop viability of this tune, the BYRDS-style guitar overdub is mixed higher here than in the other takes (and if nothing else, is certainly more comfortably played in the position of D.) The extended coda of this version (the longest of the three) also displays some extremely out of place folk fingerpicking, one of the most incongruous overdubs in any of the original lineup's recordings--save, perhaps, the pipe organ of LET'S DANCE or the closing chimes of this song's final version. The shambolic ending which the band arrives at indicates that a fadeout was clearly part of the design. Thank you to all of the readers of my efforts thus far, I appreciate your support. Gabba Gabba Hey, kids! With the final chords of I DON'T WANNA WALK AROUND WITH YOU still lingering, DEEDEE counts off the closing track of the blistering three song set which concludes their debut album. Opting for maximum impact, the boys select the last spotlight for one of their most diabolical creations-- another uneasy marriage of the outrageously unacceptable with the biographically resonant, of the profanely contrary with the strangely celebratory, & of the stunningly minimalist with the dizzyingly powerful. The subject of a heated censorial debate between the band and SIRE Records head SEYMOUR STEIN, the WWII-themed TODAY YOUR LOVE, TOMORROW THE WORLD featured one of the most aggressively shocking instances of the band's brutal humour- once again scarcely assisted by any supporting detail in the 'setup' nor a clear 'punchline.' (See RAMONES: THE EARLY DEMOS.) Grudgingly convinced that the plain assertion of the protagonist's National Socialist leanings in the verses could not stand, the RAMONES conceded to liven up the gag by making the German soldier stuporous and altering the term of affection for the secondary character from 'baby' to the more unclear (but accurately translated) 'schatze.' The overall reduction in offensiveness is dubious, and that DEEDEE's Berlin upbringing made the choruses ring with a truthful familiarity made the improvement in palatability debatable. The keen wordplay of the title is a distortion of 'Today Europe, Tomorrow the World,' a phrase widely but inaccurately attributed to a power hungry Adolph Hitler. Despite usage in U.S. propaganda, he seems to never have uttered it, and the closest appearance of the content of the motto seems to be a verse in a Hitler Youth song booklet- but it is far from exact. Interestingly enough, there is a 1944 Fredric March film named TOMORROW THE WORLD, which details the struggles of an American family to take in their care a German friend's son- who turns out to be a Hitler Youth. A possible late night viewing by DEEDEE of this oddity would go a long way in explaining the lyric's powerful, but vague imagery. The group notches up their now familiar collective approach for the record's climax. JOHNNY and DEEDEE drive unfalteringly (though, as usual, divergently) throughout, Jewish JOEY asserts a unexpectedly impassioned reading of the objectionable words, and TOMMY takes a fearsome bashing to his cymbals for the chorus. All of this leads up to the majestic, surprise coda- this time counted off 'auf Deutsch' for contextual flavor. In a career that will be full of stunt song endings, this drum heavy, medium tempo refrain shall remain one of the most memorable. The cunning placement in the running order's final spot brings full circle this section's 1-4-5 (in A) with the identical progression which dominates the opening BLITZKRIEG BOP. 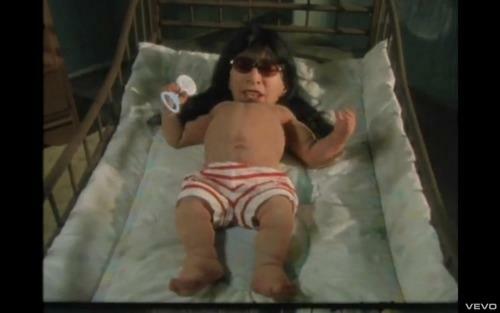 As the doctored lines now obscure the role of the Nazi's 'baby' (and also the age of the 'little German boy') the 'your' of the title seems to take on a wider, more inclusive meaning-- perhaps an unconscious allusion to the audiences the RAMONES have faced onstage and would face in the career future ahead. And before the fadeout feedback oozes out a final farewell, their exhortations to be accepted on their own, twisted terms chime jubilantly. It would be tough to slide a sheet of paper between LET'S DANCE ending and I DON'T WANNA WALK AROUND WITH YOU beginning, to cop a phrase from JOE STRUMMER. A quick, tight edit accurately mimics the nonstop barrage the band will soon be perfecting in their live sets. One of the RAMONES' earliest compositions, this track finds the band flaunting the power of raw simplicity with surprising assurance. It's easy to imagine their initial struggle to come up with material in spite of their limitations (and perhaps more importantly, their self-awareness of said limitations.) However, utilizing only four chords over three parts (E-G-A-D) and less than 15 words over three lines, the group alchemy, even early on, inverts amateurishness' drawbacks into assertive, driving strengths. With their template perhaps not yet so rigidly mapped out, a few uncharacteristic details are conspicuous. JOHNNY kicks off in open E, and plays other chords open whenever it will add to the tune's watery heaviness. He also takes a brief 'solo,' although it--like the one note lead which will later appear on I WANNA BE SEDATED-- is so primitive as to almost represent an anti-solo. The single, 'choked' bent note on E isn't even followed by the expected A release, such is the baffling purity of their odd approach. DEEDEE, on the other hand, is unprecedentedly busy, embellishing snaky riffs around the wide changes. His flourishes throughout the verses' vocals, swinging up to the bass' high end (even further than he normally prefers!) surely represent the lp's most adventurous playing. JOEY is in fine form throughout (he even throws in a RINGO STARR-ish 'Alright!' before the break), and the background vocals are particularly strong. A second rhythm guitar is wisely added to the mix, accentuating the menace of the feedback drenched drone (although the heaviness of the demo remains unmatched--see RAMONES: THE EARLY DEMOS.) This also comes to play at the song's conclusion, as the guitars ring until DEEDEE's countoff for the next track, another thrilling approximation of their stage segues. The marriage to the debut's closer, TODAY YOUR LOVE, TOMORROW THE WORLD is cunning: the exciting jump 'up' to the key of C bursts into that track's principle progression, a downward C-G-E which seems to knowingly reflect the previous song's upward E-G-A foundation- and also applies the coziness of the now familiar open E.
Kicking off something like a closing suite--a high velocity three song blast clearly designed to wrap up the debut powerfully-- LET'S DANCE finds the group for the first time dabbling in outside material. The first in a series of intriguingly chosen oldie covers, this tune--like many up until ACID EATERS--originates from the AM radio regions of the pre-British Invasion Top 40. The 1962 hit was performed by Chris Montez, a Ritchie Valens influenced chicano from southern California. Although the RAMONES often claimed they began writing their early material due to an utter inability to learn other groups' songs, this recording finds them altering the arrangement to fit their approach with striking confidence. (At this point they were also including the marginally more difficult CALIFORNIA SUN in their sets.) Unlikely to duplicate the dominant swivel of the Mexican-flavoured keyboard vamping, the band modifies the melody to fit the restrictions of their pulverizing format. JOHNNY & DEEDEE downstroke unfazed throughout- most notably through a middle break, transformed from a subdued passage of organ flourishes into a fevered rush of ascending chords. TOMMY distills the tug of war between the pushing tom verse and the snappy swing of the chorus into his codified drives. (After this, the device of drummer spotlighted tribal intros will become commonplace on their records, utilized on many of their best known songs, such as TEENAGE LOBOTOMY and ROCK 'N' ROLL HIGH SCHOOL.) JOEY seems to struggle somewhat with the accelerated pace of the wordy phrases ('Bristol Stomp and Mashed Potato too' is all but unintelligible) and the dry prominence of the vocal mix, as usual, offers little 'protection.' DEEDEE attempts to lend some support, but finally JOEY's plight is made comically plain as he misreads Montez' ad lib 'OK, Wail now!' into 'OK, Wait a minute.' In a final, backward looking nod of a touch the studio's Wurlitzer style organ is added on, fattening up the final measures and the big chorus coming out of the break. There is a touch of jingoism in the RAMONES' determined unwillingness to pay recorded tribute to any music other than the prominent pop which predated the Beatles' ascendance, perhaps a patriotic desire to reiterate this country's place as key purveyors of the form. (They were still years from finally tackling the Searchers' NEEDLES AND PINS, and that was actually written by Sonny Bono.) Perhaps more importantly they unconsciously sought evidentiary validation of their aesthetic, proof that fun primitivism wasn't a concept concocted out of thin air. Years later on ACID EATERS, with many more miles behind them, a world weary assessment of Psychedelia and English rock would be conceptualized. For now, however, as the band roars through the careening 1-4-5 romp of LET'S DANCE, the accomplished singular goal is to remind all of the celebratory power of simple, if not outright dumb, rock 'n' roll. Although conceptually the alchemical combination of bubblegum and outsider hard rock, in practice the RAMONES' material was typically divided rather clearly into either frenetic bashers or mellow ballads. However, with some regularity (usually once an album) there would be tracks where the marriage of heavily driven commercial pop reached exceptional crystallization. The British Invasion-influenced LISTEN TO MY HEART definitively stands as this release's token blast of unexpectedly melodic, catchy energy. Introduced by an assertive slide down an octave of E on guitar, DEEDEE counts the song off '1-2-3-4' (notably, deep into side 2, the first time they have begun a song in this trademark manner.) Basically verseless, the song is focused around a simple D to A chorus, and on this figure once again JOHNNY hypnotically moves 'down' while simultaneously DEEDEE moves 'up' on his bass' higher register. This change which will be recycled shortly into the verse of the next record's opener GLAD TO SEE YOU GO. Next, a strong bridge of E-G-E-A wraps up with a handclap driven display of what shall become one of punk music's dominant guitar figures: a half-step, one-fret slide down on the 'one' of each bar. After revisiting the chorus/verse the RAMONES unveil one of the debut album's niftiest surprises: returning to a misleading measure of the expected E, there is a startling jump to Dflat to begin a recitation of the lp's most forthrightly vulnerable lyric. This is stated over an E to A change which concludes in B- far from the most obvious choice to return to the dominant section's key (D), but somehow it smoothly works. All in all, it is sharp, smart middle eight--seemingly well outside the RAMONES' grasp--but of which any pop band could be justifiably proud. JOEY easily acclimates himself to the unironic resignation of the words' heartbreak, and the rest of the group similarly wield a lifetime of AM radio absorption into a bracingly winning performance. Not that this is reflected in consideration of the production-- an instrumental chorus halfway through sports an extra overdubbed guitar arpeggio which is mixed so low as to be barely detectable (although note must be made of how well TOMMY adopts to dynamic 'jumps' in sections such as these.) As well, DEEDEE adds a background vocal line at the end of each middle eight which must finally be described as unintelligible. Sometimes, to avoid pondering alternate universe's shouldabeen scenarios can be gnawingly difficult. In the mid sixties a composition this potent simply would have been bookmarked as a probable single for some lucky combo. In the contexts of this recording's eras & tastes however, an overachieving band chalks up another ace concoction for a scarcely existent (albeit rabidly clued in) audience-- and the yawning void of dull reality unworthily swallows up another barely detected, underappreciated classic. Debatably the debut album's only track with significant depth of descriptive detail, with HAVANA AFFAIR the band unveiled a duo of what would soon be apparent lyrical obsessions. First, perhaps more the result of DEEDEE's upbringing in bombed out Germany, a dark attraction to War (although in this case, the theme might be more accurately tagged as Espionage.) Second, perhaps more the result of JOHNNY's brief stint in military school, a unexpectedly intense streak of Patriotism (though this lyric finally hints that the protagonist may have jumped sides.) Like ROKY ERICKSON's Two Headed Dog, however clearly the thematic result of cold war paranoia, the words' specific meaning defy concrete explanation. Kicking off with a riff afterwards unrepeated (though hinted at at the end of each chorus) JOEY weaves the vague but amusing narrative over a now familiar four chord verse construction. For the enticing 'loco/mambo' chorus the music hovers over a G to F# change, a one fret maneuver surprisingly appropriate for such a non-gringo related piece (an unintended, unconscious choice, surely.) Then arrives a startlingly powerful middle eight, built around chords which will soon be expanded into the main melody of PINHEAD. JOHNNY doubles up the crunch with an extra guitar overdub, DEEDEE wisely dives down to his bass' lower register, and TOMMY instinctively nails it, cutting to half time on the bell of his ride and cementing the wallop with an added, nagging cowbell. For two glorious blasts, how heavy the entire first lp MIGHT have sounded is finally, teasingly realised. TOMMY also adds a rumbling, machine gun tom roll to the start of each chorus (yet another interesting flourish from a group not exactly known for arrangement ornamentation.) However, the still dominant limitations of the mix render it nearly subliminal. As well, the unnecessary double tracking of JOEY's vocal cramps the amount he can enjoy exaggerating the song's bizarre affectations (although without doubt the line concerning banana picking remains one of the album's most humorously incongruous moments.) Nonetheless, the tight arrangement and driving rhythm of the incomprehensible storyline's phrasing mark HAVANA AFFAIR as one of the most underrated tracks on their first three releases.